The Irving S. Gilmore Music Library is pleased to announce the completion of an 18-month project, generously funded by a grant from the Grammy Museum, focused on preserving approximately 335 hours of unique non-commercial audio, predominantly from 1937-1956, featuring music by Charles Ives (1874-1954). The 436 recordings, that now make up the Charles Ives Rare and Non-Commercial Sound Recordings Collection (MSS 14 HSR), many on highly fragile legacy recording formats, were digitized during the project and are now available for research. A finding aid for the collection is now available, which includes links to streaming access for each recording. 1939-01-20: World Premiere, New York Town Hall. Includes encore of last movement. 1939-03-24: CBS Music Hour, Keyboard Concerts, WABC. First radio broadcast. Emerson and Alcotts only. 1939-03-31: CBS Music Hour, Keyboard Concerts, WABC. First radio broadcast. Hawthorne and Thoreau only. 1939-09-28: Composers Forum, WNYC. First complete radio broadcast. 1969-02-07: Sprague Memorial Hall, Yale University. All other materials in the collection are available when connected to the Yale network (all networks except Yale Guest). This project increases access to the Gilmore Music Library's renowned special collections related to Ives, which includes the Charles Ives Papers, consisting of original music manuscripts, literary writings, correspondence, diaries, scrapbooks and photographs. 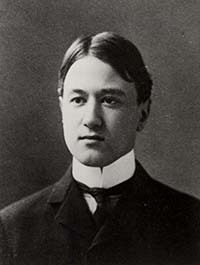 Photo: Ive's Yale graduation photograph, 1898. MSS 14, The Charles Ives Papers in the Irving S. Gilmore Music Library of Yale University. Photographer unknown.